Worn down by a seemingly endless frigid and snowy winter, I was carefully stepping my way across an icy intersection. There was another man in the intersection, an older man – though probably not much older than me – who almost slipped and fell. He recovered his balance and continued on his way, his shoulders hunched forward staring at his feet, hoping that his determined downward gaze would protect him from the ice and a dangerous, incapacitating fall. As we all were. I looked around. Everyone, including me, was tensely hunched, focused downward and inward, stepping carefully. It’s been a rough winter, filled with loss and anxiety. I pride myself on being fit and healthy, impervious to mortality, but this winter has mocked my illusion that I am in control. I fell on black ice in January, deeply bruising my tailbone and my ego. The pain was so great that I had to take a nap. Seeking healing refuge in sleep because I had no energy for anyone or any activity. Good God! Is this what people with chronic pain deal with every day? Two weeks later, I had the first of two skin excisions. No big deal, right? The skin cells were atypical and the dermatologist recommended a surgical excision out of an abundance of caution. I’m convinced it’s part of our overmedicalization and overprescription of procedures, but who am I to argue with the potential threat of skin cancer? I complied. I confidently said to the surgeon, “I can go to yoga this afternoon, right?” He laughed and told me I had to refrain from strenuous activity for two weeks. “You’re kidding, right?” He wasn’t. Good God! No wonder people become more sedentary as they get older. All these damn doctors slowing us down. Two weeks after that, my gynecologist called me with the results of my over-50 baseline bone density test. Osteopenia. Serious Osteopenia. Oh, and she wasn’t particularly cheerful either. I am really looking forward to my upcoming colonoscopy. And so, I found myself more cautious and humble this winter. Hunkering down, stepping carefully, staying inside more and opting for the cross-town shuttle in bad weather instead of walking. And so, I found myself more sympathetic and patient this winter. Pain saps energy and diminishes your ability to be generous. Fear narrows your world, keeping you in your box. I get it. My ambitious striving is subsiding, being replaced with more patience and understanding for myself and for others and our struggles. Funny, this winter of loss has made me appreciate what I do have. To treasure my health and strength and to not take it for granted. To not mind this hard season, because the sweetness of Spring is coming. The more I hunched forward staring at my feet willing myself to not fall, the more I appreciated my yoga practice and how it counteracts the fearful self-protection that can come with winter (or aging, or illness, or injury, or anxiety, or depression). One of my favorite poses is Vrksasana, tree pose. Rooting down to lift up. Rolling the shoulders back to open the chest and pecs, opening the heart. Balance. Happily taking up space, it’s the ideal antidote to anxious self-absorption. It’s a pose that shows you how lifting up, looking up, and opening your heart can change your mood. Change your life. When I first took up yoga, I devoted myself to the practice with ambition and zeal, wanting to please the teacher and perfect each pose. My approach was serious, disciplined, and tense. The more I achieved the more I came into contact with others who were better than me. More flexible, more strong, more adventurous, more serious, more spiritual, more more more. It was enough to make me cry. I began to try less hard. To stop comparing. To trust myself. To have more fun. After all, it’s only yoga. On that icy day last week, when everyone was focused on their feet, you could feel Spring waiting in the wings. The light was longer. The birds were chirping. There was hope that this had to be the end of the dreary, messy, icy, slippy, frigid days, at least for now. 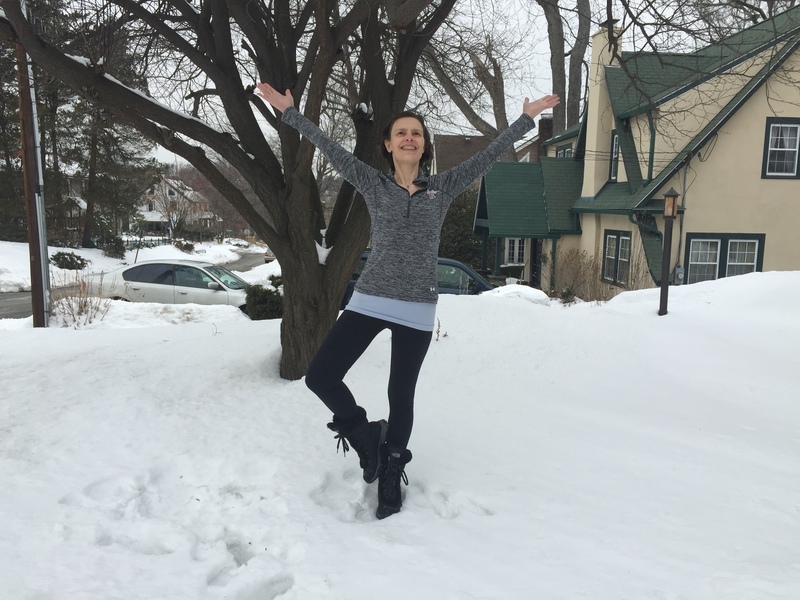 To honor the joy and gratitude I feel for my imperfect yoga practice and the community I practice with, I did a happy imperfect tree pose with the first tree we planted when we moved into our house. The tree that will be covered in flowers in a few weeks. Root down to lift up. Open your heart. Smile. Feel hopeful.